Fall decorating is one of my favorite seasons to decorate for because I am always ready to welcome it with open arms. The cooler temps and beautiful colors are a nice break from the heat and humidity of the summer. This weekend, I started decorating and came with with a simple fall garland that was easy to make. This DIY fall garland came together in no time and I am excited to share the process with you. Matt cut the triangles out for me from a piece of scrap wood we had in the garage. 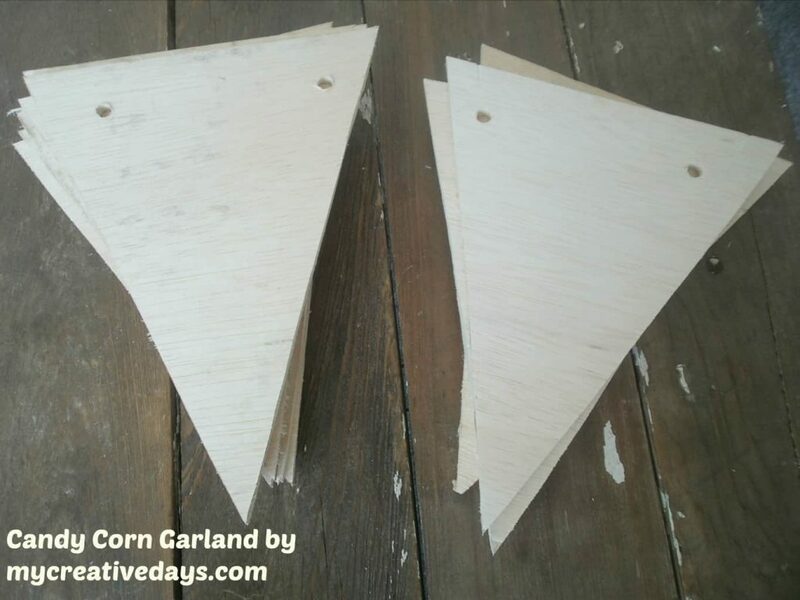 You can definitely buy wood triangles that come as a garland set as well. (I have linked to those in the supply list above.) 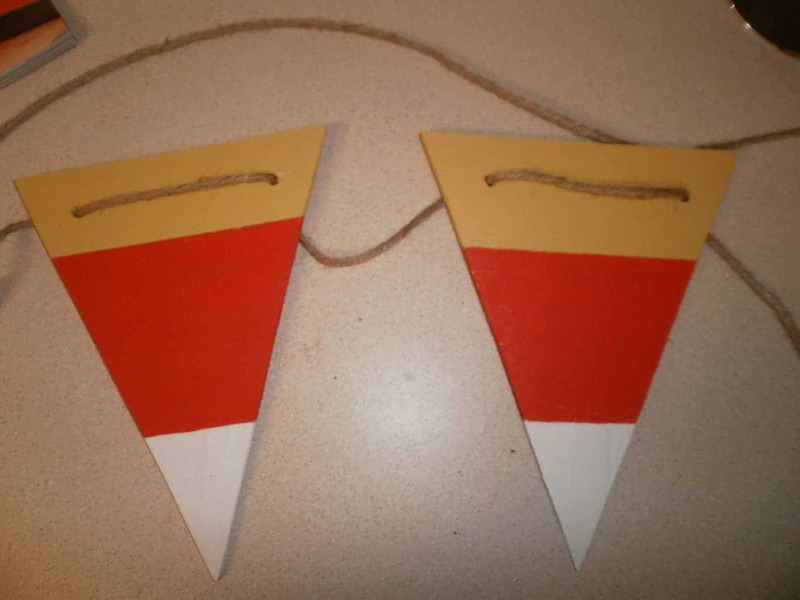 He drilled two holes in the top of the triangles so I could thread the twine through them. 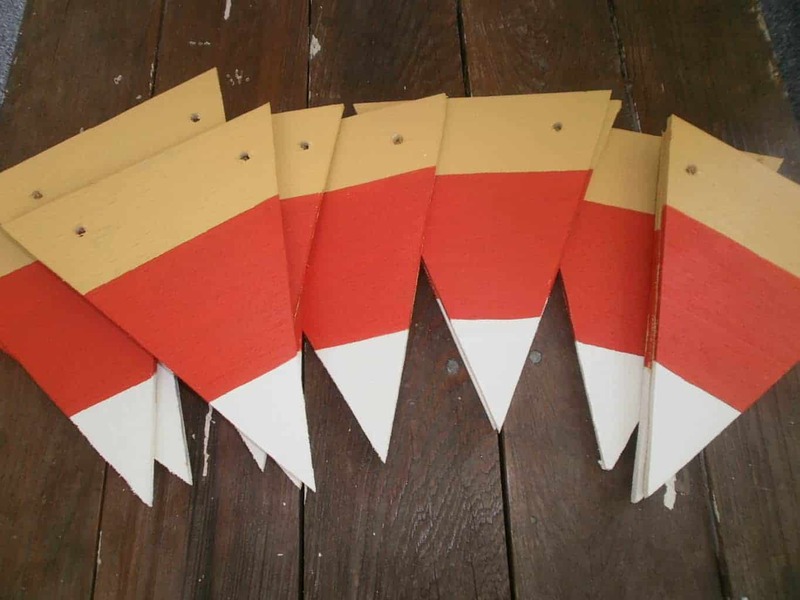 To make the triangles look like candy corn, I just taped off different sections so I could paint each one yellow, orange and white. #1 – Who has the time for that? #2 – How many times do you get perfectly matching candy corn when pull them out of the bag? Just sayin’! After I had them all painted, this is how they looked! I did paint the back of each one in the yellow paint. I strung each one on a long piece of twine to complete the Candy Corn DIY Fall Garland. We had enough triangles to make a couple sets with six candy corns on each one. Simple, cute and fall related. A triple threat fall decor item! It can’t be beat. I hope this easy project has inspired you to create some fun fall decorations for your home this year! Thank you for your comment and I linked up! Thanks for the invite to your party! These are so cute! I love the way they turned out! I saw you on Fridays Five Features! If you like to link up come over to Craft Frenzy Friday at http://www.craftdictator.com! Thank you for your comment! I tried to link up a few times, but it would not work for me. I would go to your site and it would freeze on me each time???? these are adorable!!!! stopping by from the twelveoeight link up ! Thank you for your comment! I am glad you stopped by! Your garland is adorable. I have to get my hubs to cut these out for me. I have some thin plywood so this would be perfect for it. Can get it going tomorrow. I want a cute garland to hang on front porch railing besides the usual fall leaves, etc. Sure glad you posted this. Happy week. I am so glad you liked them! I thought they turned out great and they are something different for fall decorating! Love this! 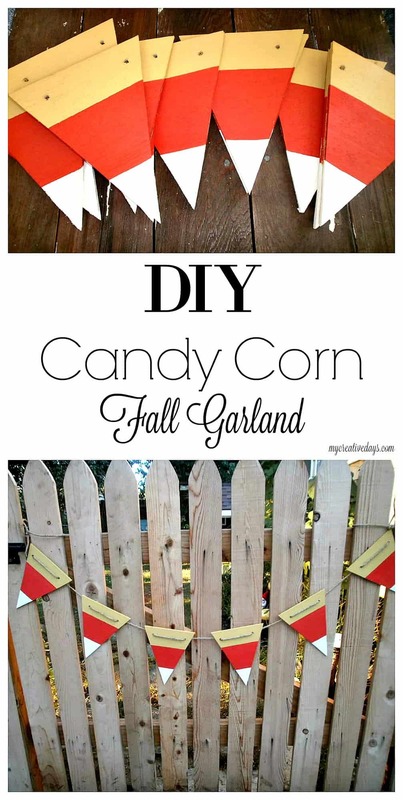 I think candy corn themed decorations are so cute for the fall, and your garland would be perfect decorating a porch railing or mantle. Thanks for the inspiration! Your most welcome and thank you for stopping by and leaving a comment! This turned out so cute! It’s perfect for fall. Would you mind to link this up to my Frugal Crafty Home Blog Hop? We love seeing easy crafts like this! The party goes live every Sunday evening at 8pm central time. I’d love to see you there! Thank you so much for your comment! I will try my hardest to remember to link up this Sunday. Thanks for the invite! Adorable!!! What fun your garland is. 🙂 We love candy corn, too. Thanks for sharing your idea and how-to. 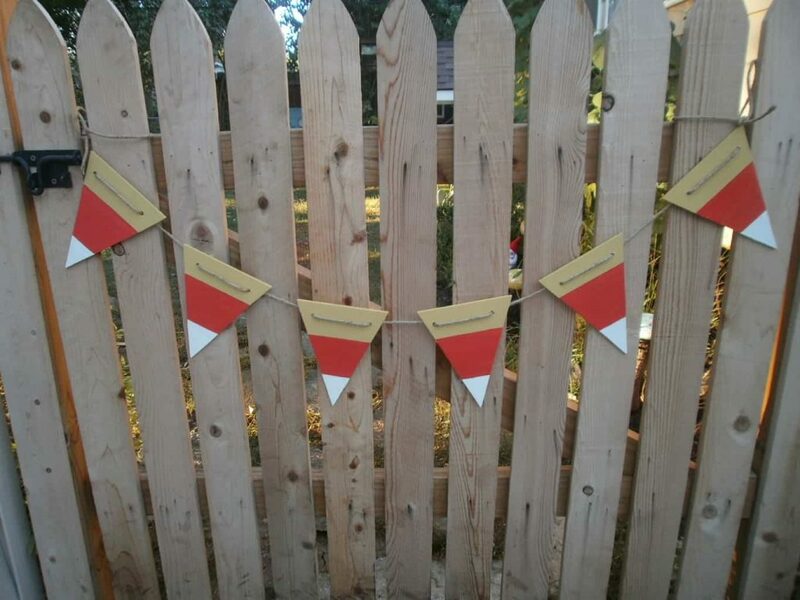 They look so good on your gate! I think I would protect them with acrylic and use them outdoors. Great project! Thank you for your comment! I did spray them with a clear coat of Polyurethane after the paint dried to help protect them. These are so cute. I can think of a ton of uses…they would be great as part of a wreath (maybe with 3-4 of them) or hung across a mirror or mantle indoors…the possibilities are endless! I’m visiting from the Thrifty Thursday link party. Great ideas! Thank you so much for visiting and come back soon! So cute! Thanks for stopping by DIY Vintage Chic’s Friday’s Five Features and Fun Festivities. Don’t forget to stop back by this Friday! You are always so creative!! Thanks for linking up to Tickled Pink Times Two!! Thanks so much! Your comment made my morning pinkeriffic! So cute and quick! 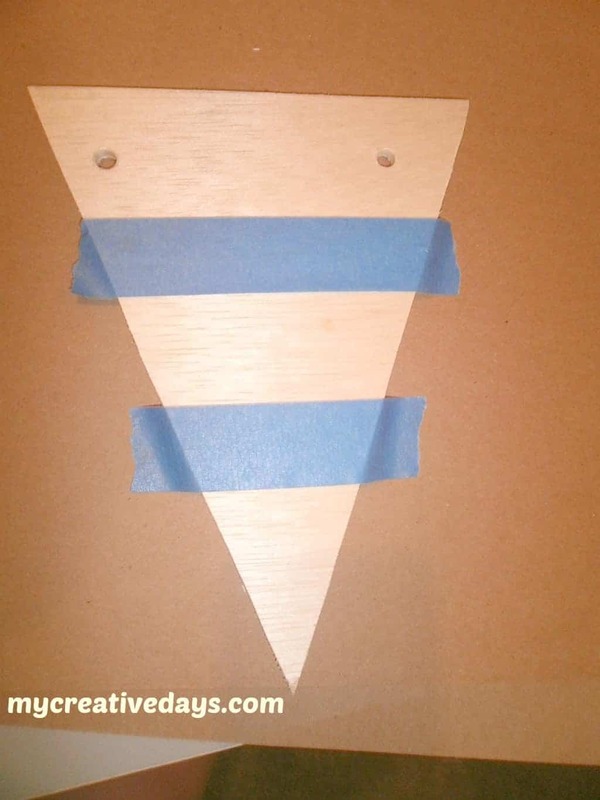 I don’t have any scrap wood that would work for this, but I know the craft stores sell balsa wood triangles like these. Pinned this for later! 🙂 This will look adorable above my TV.